Another Friday night lands me racing out the door to get her to the rink in time for skating. Yeah, it's been a long week and there seems nothing more inviting then sinking into a comfortable chair and taking a moment to Breathe. But...when you have three kids there's bound to be someone or two who needs to be rushed somewhere for something. Friday night is no exception, there is no meeting up with girlfriends for drinks and heading out for a night of dancing. There is no anticipation of getting ready for a romantic dinner and movie with the "man of your dreams", there is no hour long soak in a frangrant bubble bath and curling up with the latest juicy novel. Nope, those days are gone. So off we go, dinner is a coffee at the rink with an ice level seat, so she can see me and wave every time she looks up. 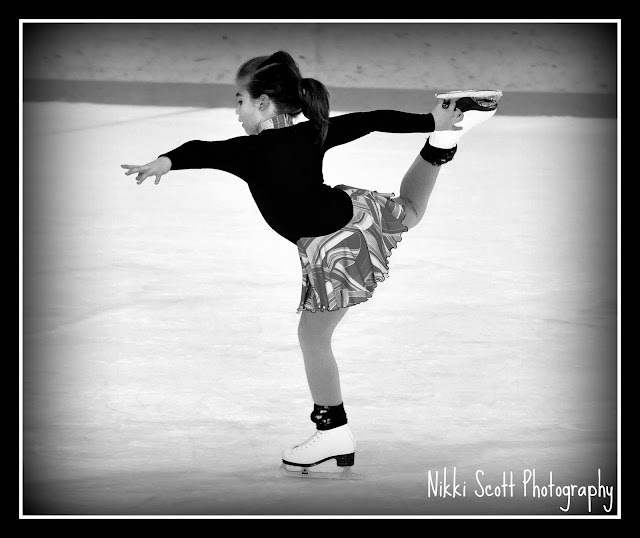 An hour and a half of learning her edges, around and around the rink. I usually bring a magazine or my laptop and drift off into some self indulgent quiet time, looking up every two minutes or so to catch a big grin and a wave from her. Today I brought my camera and stood by waiting and poised to capture her whizzing by. Usually a blur or just as I press my finger on the shutter release button someone else skates into the frame and I miss the shot. As I stood there watching intently waiting for her to sail by me, I found myself with a satisfied smile permanently plastered to my face. I feel complete joy....joy in knowing she is living her dream, her dream that only a five year old can have. Not worrying about anything else at that moment but skating her best and blowing kisses to mommy. I realize camera in hand, eyes blurring from threatening tears, that this is what life is, this is everything I want and need, this is the best night of the week.....Friday night at the rink!